As a "Zen master of jazz piano" and one of its greatest innovators, Jamal evolved his elegant sound with this adventurous record. The Awakening showcased his fast, richly melodic chops in remarkable variation. 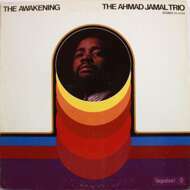 A consummate orchestrator of his own complex arrangements, Jamal was emboldened here by his potent sidemen. Backed by the exquisite timing of bassist Jamil Nasser and the precision of Frank Gant's drumming, he was liberated by the reliability of the trio setup. Free to juggle rhythmic dexterity with harmonic intricacy, Jamal brilliantly performed groove-oriented compositions written by himself, alongside wonderful renditions of tracks by Herbie Hancock, Oliver Nelson and Antonio Carlos Jobim. It is impossible to discuss The Awakening without acknowledging its indelible mark on golden age rap. A defining album of hip-hop culture, producers of the highest calibre have famously sampled elements of this timeless record to lace all-timers with a foundation for their most legendary tracks. Indeed, both the experimental "DJ Premier In Deep Concentration" and Shadez Of Brooklyn's seminal "Change" utilised Jamal's sparse title-track to stunning effect. A melancholy motif from "I Love Music" was employed by Pete Rock for Nas's crucial "The World Is Yours" whilst, over a more abstract refrain from the same track, Jeru memorably delivered his "Me Or The Papes" ultimatum. Over in Chicago, No I.D. elevated Common's peerless "Resurrection" by lifting a precise riff from Jamal's plaintive rendition of "Dolphin Dance" whilst the head-nod quality of All Natural's hypnotic "Renaissance" owes it all to the looped keys of Jamal's take on "You're My Everything". With bold beauty and unhurried grace, Ahmad Jamal plays piano differently from everyone else. He was a huge inspiration to Miles Davis and influential to how Wynton Kelly performed across Kind of Blue. In his autobiography, Miles describes being blown away by Jamal's dynamic "concept of space, his lightness of touch [and] his understatement". It's why The Awakening will always be so revered.